This new limited edition release showcases Arkle’s illustrations, this time taking inspiration from the leather suitcase of a global traveller. Non chill filtered and natural in colour, the new expression will be priced at £36.99/€49.99/US$64.99. Matured in first fill bourbon casks, honey, vanilla and caramel on the palate are followed by bright notes of pear drops, lemons and coconut. The finish is described as long and sweet with hints of toffee and spices. A new look for Speyburn’s 25yo Highland Single Malt Scotch Whisky will also be showcased. 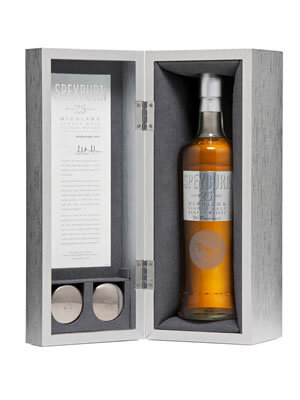 Previously named Speyburn Solera, the 25yo has undergone a redesign, with the bottle shape, label and packaging all modernised to give the expression “an elegant and premium look”, the company said. The new bottle is tall and etched with Speyburn’s rounded fish salmon. Each bottle will feature a new silver label and will be presented in a wooden box with two engraved stainless steel tasting cups. An insert hand signed by Speyburn’s Distillery Manager will complete the package. International Beverage will also be unveiling a new high-aged expression of Old Pulteney Single Malt Scotch Whisky, as well as travel retail exclusive 1996 and 2002 vintages of Balblair Highland Single Malt Scotch whisky. Blended Scotch whiskies from Hankey Bannister, MacArthur’s and Catto’s will also be featured alongside Caorunn, the super-premium Scottish small batch gin which is said to be selling well with World Duty Free Group. Also on show is Phraya, a new super premium Asian rum that was launched with King Power Group in Thailand last summer. The 12yo rum is distilled and bottled by Thailand’s Sangsom Distillery; it is deep matured in oak barrels and then only the finest rums are selected for blending. International Beverage Global Travel Retail Manager James Bateman commented: “We are delighted to be launching these new products to our customers. The TFWA World Exhibition remains the perfect platform to unveil our new super premium spirits offer and launch yet more premium travel retail exclusive single malt Scotch whiskies, in addition to our award-winning portfolio of spirits.